Meizu’s new Pro 7 and Pro 7 Plus dual screen rumours caught our attention a while back, thanks to the super AMOLED touchscreen on the back. Proving that the rumours were true, Meizu recently sent invites for the announcement of its Pro 7 lineup on 26th of July. Meizu announced the Pro 7 and Pro 7 Plus in a tweet on Wednesday. The Pro 7 and Pro 7 Plus were launched with an interesting feature – dual super AMOLED display for the front as well as the back of the handsets. Designed by the design studio “Frog,” the 1.9-inch screen lights up when flipped over and can be used to display notifications, weather, time, playing music or maybe for a quick selfie session using the rear camera. Unlike LG and HTC’s “Second Screen” iterations, Meizu Pro 7 phones may be more practical and cooler versions of the dual screen setup. Priced at $430 and $530, the Pro 7 and Pro 7 Plus are expected to go on sale from 5 August 2017 in China. The 5.2-inch Pro 7 features a 1920 x 1080 pixel Super AMOLED display and is powered by Helio P25 chip. 4 GB RAM and 64 GB onboard storage brings the phone to par with 2017 flagships. The Pro 7 has a 3000mAh internal battery and support for ‘mCharge 4.0’for faster charging. Meizu claims that mCharge 4.o technology will provide upto 67 percent battery charge in 30 minutes. A high edition version is also available for the Pro 7 with an extended 128 GB memory and the Helio P30 chip which has a 10-core processor made by 10 nm manufacturing process, making it the first smartphone to use the technology. The higher version of Pro 7 also has IMG PowerVR 7XTP GPU. For an extra $100, the Pro 7 plus boosts almost all those specs in the Pro 7 variant. A slightly larger variant of the Pro 7, the Pro 7 Plus offers a 5.7-inch QHD display, 6GB of RAM, a Helio P30 processor, and a choice of 64GB or 128GB of storage. Unlike the Pro 7, the Pro 7 Plus offers a slightly larger 3500mAh battery and offers support for ‘mCharge 3.0’. The phone also has a 10nm chipset including 10 cores made up of three clusters — two Cortex A73 cores that go up to 2.6GHz, four Cortex A53 cores clocked at 2.2GHz, and four energy-efficient Cortex A35 cores at 1.9GHz and a IMG PowerVR 7XTP GPU. Both the smartphones have M touch fingerprint sensors, run Android Nougat 7.0 based Flyme skin and have Hi-Fi audio. The phones are decked with Sony’s IMX386 imaging sensors and 12 MP dual-camera setup – a primary RGB sensor and a secondary monochrome sensor with f/2.0 aperture for improved low-light performance, as well as a 16MP front-facing camera. Though the phones are set to be up for sale on 5th August in China, no information about the release in other countries have been disclosed yet. Implying that the wait may be a bit longer than we expected. 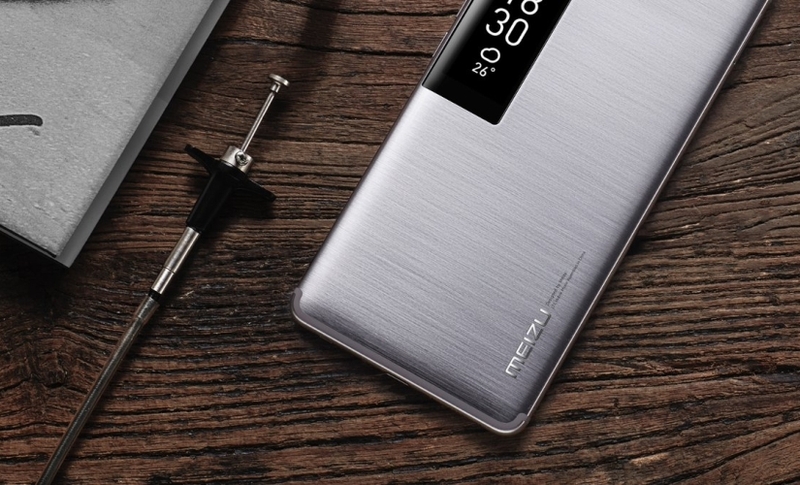 Meizu also announced the ‘Meizu Flow headphones’ along with the unveiling of the smartphones indicating that unlike Apple, the phones has decided keep the 3.5mm headphone jack.